There are dozens of drawing apps that are good fun, especially for kids, but there is only one that I keep coming back to for its sheer loveliness. 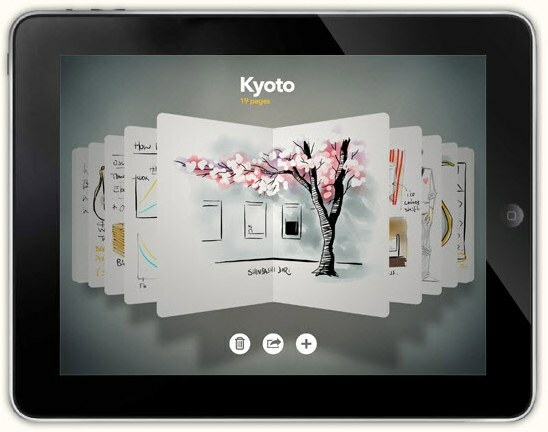 Paper by Fiftythree balances functionality with a unique, almost delicate feel.The app can be used for notes, drawing and ‘painting’. Open a ‘notebook’ (and you can customise the cover of your multiple notebooks in Paper, although all look like compact Moleskine journals) and start taking notes with either a ballpoint pen or, for a more traditional look, a fountain pen. You simply write with your finger and the words appear accurately on the screen. I note the accuracy because my barely legible handwriting is still barely legible in Paper! Whether your writing is neat or otherwise, the detail is incredible. For example, when using the ballpoint pen your downward strokes are slightly thicker at the bottom, in the same way an actual ballpoint makes tiny ink-blobs when you write. Likewise, the fountain pen has perfect thick and thin strokes which are so impressive that even my scrawl looks lovely. Of course the numerous pens and tools are not just for writing – Paper is essentially a drawing app. Choose your colours from a huge palette or create your own custom palettes with the impressive ‘mixer’, which allows you to fine-tune colours until you create your perfect shade. My favourite tool is the paintbrush which gives a water colour effect to your drawings. Run your finger repeatedly over the one spot and the colour saturates, just as it does with actual water colour paints. The colours layer and bleed into the ‘paper’ slightly and the results are so startlingly real that you’ll feel compelled to touch the textured paper. An eraser is included in the Paper toolbox but there’s another feature that is far more powerful – Rewind. Like an ‘undo’ command, Rewind undoes your drawing, brush stroke by brush stroke if you make a mistake. It’s far more accurate than charging in with the eraser which is all that most other drawing apps allow. Kids will love Paper – the tools are intuitive (after all, it’s all done with your fingers), there’s variety and the results are spectacular. Plus, there’s an unlimited supply of fresh paper for drawing on! Paper is free via iTunes however you really need to buy the additional tools from the in-App store to use Paper to its maximum potential.